I've been intending to write a review of this film for a month or so, even before I actually started posting again, but after watching it for the third time overall (and second within five days), I decided I'd waited long enough. The number of times I've watched the film gives some indication of my feelings towards it, but just in case there is any uncertainty, I absolutely adored 'The Muppets'. It's as close to a perfect feel good film as I can think of, so wonderfully and unashamedly joyous that I struggle to imagine how you could watch it and not smile for the majority of the 1hr 46m run time. One of the films I remember most clearly from my childhood, distinct from all the animated Disney films I watched incessantly, is 'Muppet Treasure Island' (1996). The film was a fantastic and ridiculous take on the classic Robert Louis Stevenson novel, full of swash buckling, buried treasure and a whole host of bizarre comedy. Ever since seeing that, as well as the Muppet's take on 'A Christmas Carol' (1992), a few of the original episodes and lots of the other show featuring Jim Henson's creations, 'Sesame Street', I have held a special place in my heart for those brilliant little puppets and their crazy antics. 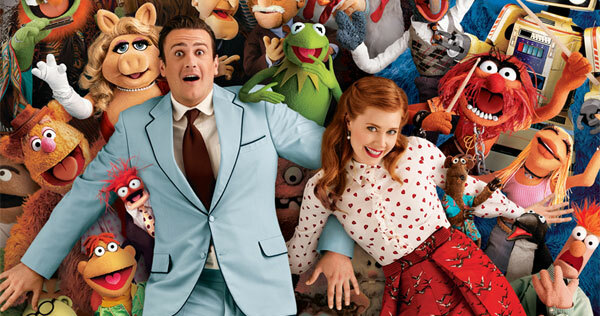 So when it was announced that Jason Segel, a man I was already fond of due to his role in the U.S sitcom 'How I Met Your Mother' and his brilliant performance in 'Forgetting Sarah Marshall' (2008), was writing and starring in a new Muppets feature film, I had a suspicion I would enjoy the final product. Somehow despite my almost impossibly high expectations and rose tinted nostalgia, the film managed to pleasantly surprise me. The film tells the story of Walter, a Muppet, and his human brother, Gary (Segel) and his long time (and suffering) girl friend Mary (Amy Adams) who discover a plot by the so evil he sings about it, Tex Richman to destroy the Muppet theatre and drill for the oil beneath it. To fight back Walter decides to round up all the Muppets for one last show, a telethon with a target of $10,000,000. As the show unfolds and the cameos pile up, the film just gets better and better, adding genuine heart and emotion, both fuzzy and fleshy, to the comedy and musical numbers. As for the musical numbers, they are such great tunes you catch yourself singing them for days afterwards, especially two written by Bret McKenzie, one half of Flight of the Conchords. There's the infectiously cheery 'Life's a Happy Song' and possibly the best ballad from any film in recent history, 'Man or Muppet', which won an Oscar for best original song, while Kermit, Miss Piggy and Mary all get their own moments to shine on the soundtrack. The human actors, both main characters and cameos, are pretty much without exception excellent, but it was always going to be the puppets that were the stars, just as it should be. It's amazing how engaging and expressive the Muppets are, to the point that you don't have to put much effort into suspending your disbelief at the interactions between human and Muppet. The film draws you into it's world and you quickly begin to believe in the relationship between Walter and Gary, but more than that you also start to invest in the purely felt based friendships and romances, especially the will they wont they drama of Kermit and Miss Piggy. The film has real heart and a clear and intense belief that sometimes a film can aim simply to make the audience smile from ear to ear and in that regard, as in so many others, 'The Muppets' is a rousing success. Funny, entertaining, proudly nostalgic and determinedly happy; 'The Muppets' is a film that offers great tunes, laughs and more than a little heart, appealing to adults and children alike in a way you rarely see outside of Pixar movies.